A walk through London’s “Camden” is to step back into a time capsule of musical history, its venues, bars, and streets known the world-over for hosting some of the biggest, most talented musicians to ever come out of the Big Smoke. From punk-rock legends to Brit-pop bad boys, Camden has seen it all. Though many ghosts of voices past live amongst the neighborhood’s haunts, none have claimed it more so than Amy Winehouse. Claiming Camden as her “playground,” Amy still lords over the area with her bronze statue in the Stables Market and the large-scale portrait of her on the Earl of Camden pub’s exterior, reminding everyone of her enduring legacy. Talk to many of the locals, and they’ll still remember Amy holding court in the pubs, laughing her contagious, filthy laugh, and beaming with a light that most of us only saw extinguishing in front of the world’s media. Although Amy Winehouse died in 2011, those who knew her and those who were affected by her music will remember Amy as more than just the messy, troubled addict she was so often painted out to be and rather as a songstress with the kind of soul few have ever truly had. Amy Winehouse – Back to Black, the new documentary from Eagle Rock Entertainment, explores the making of the late singer’s 2006 breakthrough album Back to Black, delving into the creative process of making this seminal record in intricate and deliberative detail. What makes this documentary such a pivotal and refreshing watch is its focus on Amy the artist rather than the often-overshadowing narrative of “troubled Amy,” territory that was already mined to great success in the 2015 Asif Kapadia documentary Amy. Of course, Back to Black as an album throbs with the emotional lacerations of a tortured soul, but Amy Winehouse – Back to Black reframes the songstress’ story, this time focusing on the nuts and bolts of her triumphant record, thoughtfully dissecting the album track by track by the professionals involved in its creation. Finally, we have a film about Amy that pulls away from the flash of the paparazzi and into the truth of a supremely talented musician. The hour-long documentary opens with footage of Amy Winehouse’s 2008 Grammy Awards appearance, a night which saw her win five awards, a first for any British female artist, accepted via satellite from London. Backed by the Dap-Kings, Amy is seen in her musical element on a triumphant night, her small frame and signature beehive swaying to and fro as she belts out the vocals that earned her so much recognition. 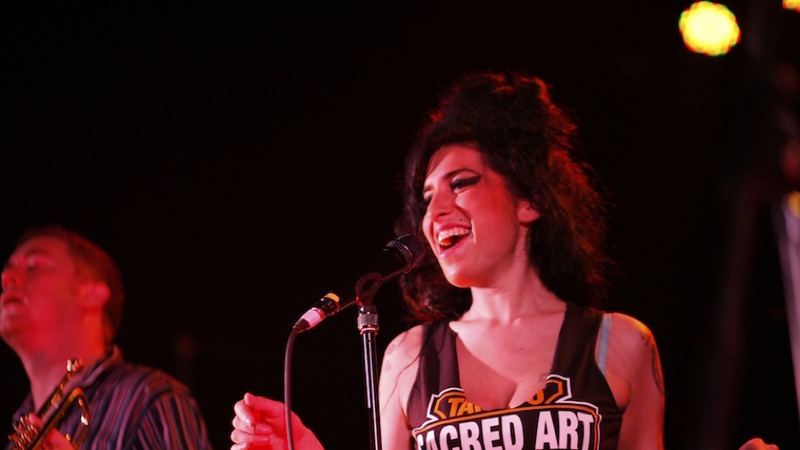 The film then reflects back to 2004 when Amy first began work on her ground-breaking album, which has gone on to sell over 19 million copies worldwide. Fresh interviews with Back to Black producers Mark Ronson and Salaam Remi, mix engineer Tom Elmhirst and studio musicians including the Dap-Kings form the backbone of the doc, as they listen to the songs they helped create and recall memories of their time working with Amy. The accounts are bittersweet as they reveal anecdotes about their friendship with the singer, each one tinged with the regret of loss. These stories are coupled with intimate footage of Winehouse in the studio as well as close-ups of her handwritten lyrics, shedding new light on a musician whose creative process was wholly singular and entirely based on her own unique identity. In one particular conversation, Mark Ronson recalls questioning Winehouse on her lyrics “We only said goodbye in words / I died a hundred times” in the title track. Confessing his preference for lyrics that rhyme, Ronson asked her if she wanted to rewrite it. Amy, we’re told, replied with confusion and bewilderment, “Why would I change it?” as if the very idea of altering her truth in any way was the most confounding thing on earth. An artist true to herself and her musical vision, Winehouse reveals in an interview that the retro sound she became so known for in Back to Black stemmed from her days playing pool in Camden pubs, and listening to doo-wop and 60s Motown girl-groups on the jukebox. Winehouse connected with the heartache and passionate truths that so often lilted out of the lyrics of these bygone era songs, her own feelings and emotions percolating within in her so intensely that they were just waiting to be put to paper and similarly sung. The film is littered with fascinating insights into the making of Amy’s most influential and, sadly, final album, giving us a portrait of a young woman whose sole wish for her art was to have her stories told. Far from hoping to be a celebrity or a make millions on records, Amy Winehouse wanted to free herself from the heavy weight of her torrid emotions, which she could only do through song. Like Kurt Cobain, Janis Joplin, and other visionaries whose lives were cut too short, Amy Winehouse has solidified herself as a musical martyr, the pain she expressed in her music helping so many others get through their own struggles by connecting to her lyrics. Just as Amy’s life was all about music, so too is this celebratory documentary that truly does justice to her memory. The footage we see in the doc of Winehouse smiling and enjoying life in the studio is the way she should be remembered. The pain she carried with her can never be forgotten as it led her to the creation of her incredible music, but it is the talent that she gifted us with that should surely be her enduring legacy. Amy’s ghost might linger in the streets of Camden, but her voice will live on in the hearts of everyone her music touched. Editor’s Note: Amy Winehouse – Back To Black: The Documentary was released on Nov. 2, 2018 on DVD and Blu-ray. In addition to the documentary, Eagle Vision has added previously unreleased live concert footage from the 2008 Grammy night called An Evening in London that Winehouse performed for friends, family and record execs at Riverside Studios.